Due to the many recruiting challenges brought on by the current driver shortage, it is difficult to justify investing time and resources in improving your current advertising process. If it isn’t broke, don’t fix it, right? However, what if you are missing out on finding the most qualified drivers by executing your advertising model solely from your point of view? From your point of view, it makes sense to tell prospective drivers your company is the best fit for them by “feature dumping”. There is the long list of benefits and features you have available, such as company history along with the company’s list of accomplishments. This is a strong way to immediately earn instant credibility. So what is the issue? The problem is it does not take a driver’s point of view into consideration. From a driver’s point of view, immediately discussing the long list of benefits, features, history, and accomplishments gives the first impression that your company is impersonal and self-centered. This approach is problematic because it focuses solely on your company, and not the drivers. It does not communicate the importance for your company to exceed the driver’s expectations and job requirements. Think about any advertisements that were memorable to you. It is easier to relate to the ones that resonate with you personally. That should make it easier to understand when a driver cannot relate to your advertising if it doesn’t feature something personal to them. You may argue that your advertising does focus on what resonates with drivers. Most driver’s are attracted to pay, home time, equipment, miles, and other company benefits, understandably. 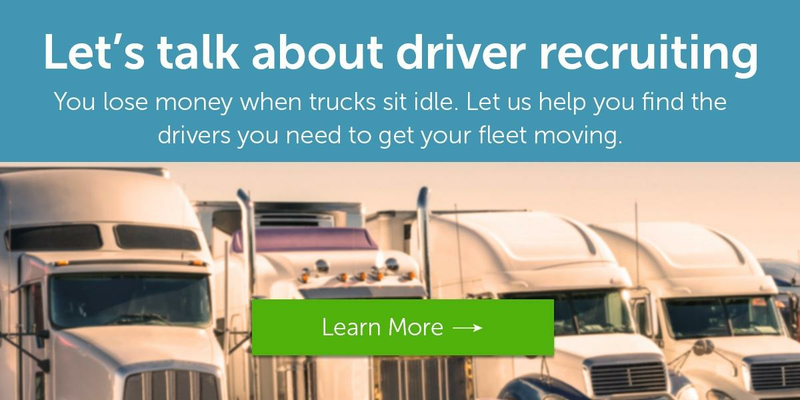 However, unless you are offering better pay, more home time, newer equipment or better benefits than your competitors, you are not going to distinguish your company from the other trucking companies competing for the same limited pool of drivers. What can you do to stand out? You may want to consider a driver’s perspective and what is most important to them. It is important to prove your authenticity and establish credibility with prospective drivers. Giving them a unique opportunity to talk with your current drivers will have a greater impact than you speaking with them. This gives prospective drivers insight into what it is like to work for your company from a current company driver’s perspective. Utilizing driver testimonials and featuring drivers in your video’s makes your advertising more relatable to drivers. You can also feature images of drivers in your advertising to make a good first impression. The average American sees 4,000 to 10,000 ads daily. This trains the human eye to spot a sales pitch from a mile away. In addition to those daily ads, drivers see ads directed toward them specifically. With the continued driver shortage leaving so many fleets to compete for the attention of the same drivers, it is difficult to imagine just how many ads a driver is saturated with daily. This greatly heightens the importance of having stand-out messaging and the way to stand out is not as complicated as you might expect. Having a down-to-earth tone and being honest goes a long way with prospective drivers, and it helps to be direct and straight to the point. Strong Safety Measures: It is important to have safety measures and how your company follows established safety policies. You may want to review and discuss your strong safety record. Comfortable Truck Seats: The driver’s seat of a truck is where the majority of a driver’s time is spent. Offering very comfortable seats is a very important feature. Pet Policy: Since the majority of a driver’s career is spent alone, providing the option to have the company of a pet while on the job could be the deciding factor for a driver. When a driver is considering working for a new company, they want to know they will be recognized and appreciated within your company. It helps to provide an accurate perspective on your company’s culture and how your company communicates their appreciation to current employees. You can use social media posts to show how your company recognizes million milers, safety award recipients, student driver graduates, new hires, etc. Although it may be easier to continue advertising the same way, you need to consider a driver’s point of view. Focusing your advertising solely on your business prevents you from differentiating your company from your competitors. You must show prospective drivers you are the right fit for them by making your advertising “driver-centric”.